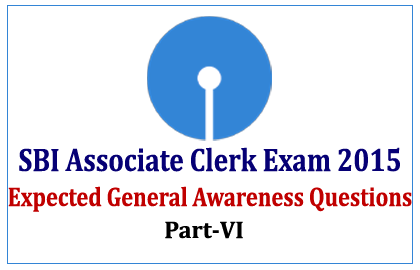 Expected GK Questions for the upcoming SBI Associate Clerk Exam 2015 were given below. Candidates those who are preparing for those exams can use these questions to score more marks. 1).Headquarters of SIDBI is located at? 2).Who is the Current Health Minister of India? 3).Which of the following state is famous for Rauf Dance? 4).Among the following, which state has the highest rural population? 5).India has developed the LRSAM missile with the help of _____? 6).What is the Capital of Sweden? 8).World Chess Championship 2014 was held at? 9).What is the Venue of APEC Summit 2014? 10).Who got the Test Cricketer of the Year Award?